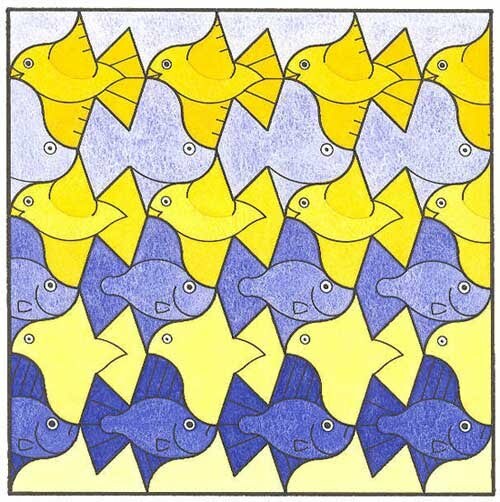 As such, the term counterchange is perhaps not one that people are too familiar with, even with those who are interested in tessellation, and so to clarify this matter as applied to tessellation I thus simply define a counterchange as a 'switchover' or 'transposition' of motifs, as what was once foreground (with a motif) becomes background, and vice versa, generally, but not always, viewed in a lineal direction, either horizontally or vertically as the motifs are most appropriate for. Even so, despite the above description, the definition still lacks clarity, as such is a concept that is more readily viewed than described, of which the saying ‘a picture is worth a thousand words' is most appropriate. Therefore, without further ado the reader is referred to the examples below, which will make clear such matters in an instance rather than with any amount of lengthy words. This example is of a lineal type, using the ‘Pólya tile', with the bird motif consisting of my own design. Now, as the tile possesses order 4 rotational symmetry, with, in this particular instance, potential ‘non-aesthetic orientations' that should be avoided (as discussed above), thereby the motif is so ‘placed' as to be of the translational and not the rotational type. 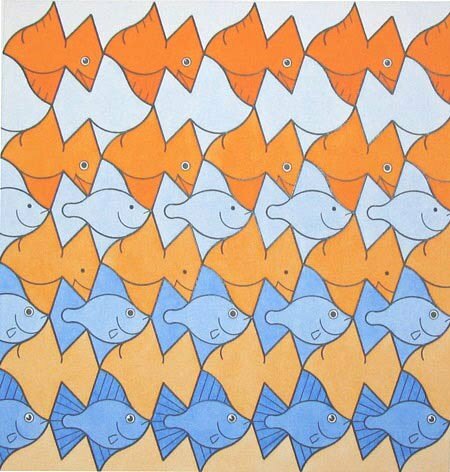 The counterchange is to be viewed in a left to right direction, from which the figure and ground subsequently have been seen to have ‘switched over' or alternatively ‘transposed', depending on choice of phrase. As such, although the counterchange can be said to be ‘perfect' in that it ‘obeys' all the rules, in an aesthetic sense it is still somewhat lacking. This is because the composition in effect simply ‘changes the colouration' of the birds and nothing else or more. A more ideal use of motifs would be birds and fish (as exemplified by No.2 and 3 below), whereby the 'switchover' would be more obvious. Therefore, as it is thus self evidently ‘lacking' in this respect in cannot be said to be aesthetically pleasing in the stricter sense. This is very similar in both idea and motifs to No.2, as it essentially consists of the same two motifs, albeit subtly differently, and also of which the orientation of the motifs has been rotated 45°. Furthermore, the format has now changed from a square to a diamond, of which the relationship to Escher's Sky and Water I is now even clearer. An additional aspect to the motifs having been rotated 45°, arguably of an improvement in aesthetics, is that they now emphasise even more their respective domains, as the motifs can be seen to ‘soar' and ‘plummet' as appropriate for each motif. Furthermore, the undertaking of the colouration was carefully planned, of which it can be seen to differ noticeably from No.2. Essentially, that colouring can be described as simple, in that the two colours remained the same, albeit fading and gaining in their intensity. In contrast, the colouring here, although again of a similar premise, is more subtle as it uses complementary colour (as discussed in Essay 1) to fade to a background grey for both motifs, of which great control of colour was of the utmost importance, and of difficulty in a technical sense, resulting in a most pleasing effect indeed. Indeed, just as Sky and Water I can be regarded as the pinnacle of Escher's in concept and of those specific motifs, likewise with the example of mine here I regard it in the same spirit. As such, the counterchange here is somewhat more involved than with an ‘orthodox' example, as it has an additional aspect, namely a development in conjunction. Before proceeding in further detail, I apply the term development in the sense that Escher used in his print Development I, with squares developing into lizards, in this instance from the outside to inside. As to the counterchange composition per se, this in effect is undertaken to show an additional possibility to the field, whereby successive occurrences of the motif alternatively change i.e. background and foreground interchange as the eye moves around the outside of the composition. In effect, the composition has what I term as ‘having fulfilled its potential', as every possible placement of the motif, in all four possible orientations, has now been shown with a counterchange. Now, as regards the underlying structure, it can be seen that the composition is based upon an underlying 10x10 square grid, and therefore the motif must of necessity be based upon a square. 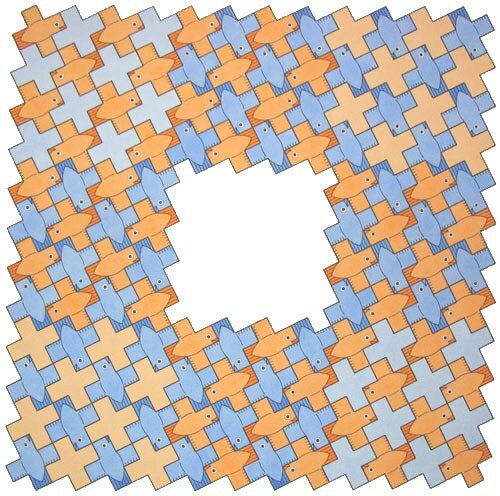 As a feature of a square is that it possesses order 4 rotational symmetry, the tessellation to chosen for this composition must also possess these features. 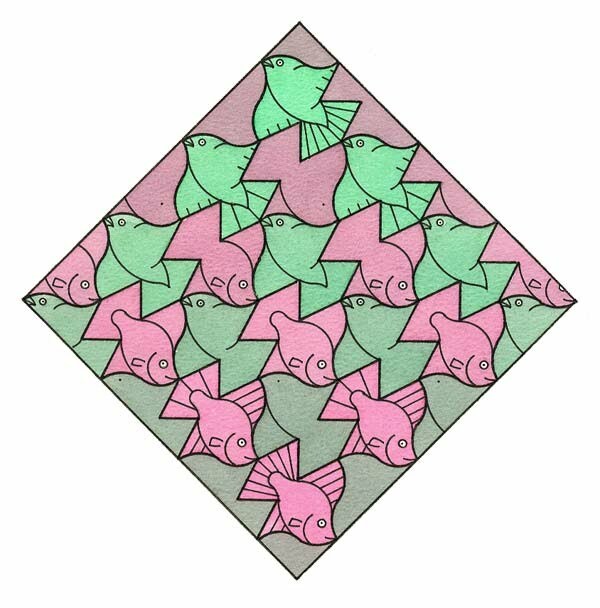 Therefore, any tessellation with these properties can thus be used for this purpose, with the arbitrary example chosen based upon the favoured ‘Pólya bird' (Bird 1, No.1) tessellation. Concerning the development here, in contrast to the above example of Escher's, this can be seen to develop from inside to outside. As to the choice of colours, there is nothing significant per se in their selection, albeit chosen with contrast effects in mind. The colouring here, of brown and orange emphasises the development, with paler hues in the centre, gradually gaining in intensity, towards the outside, in effect ‘in tandem' along with the development of the birds, of which thus culminates in a superb example of its type. This particular example shows a counterchange that although based upon a squared composition can be described as cyclic, as the composition forms a “square loop” as the eye moves around, essentially intended to have no beginning or end points. 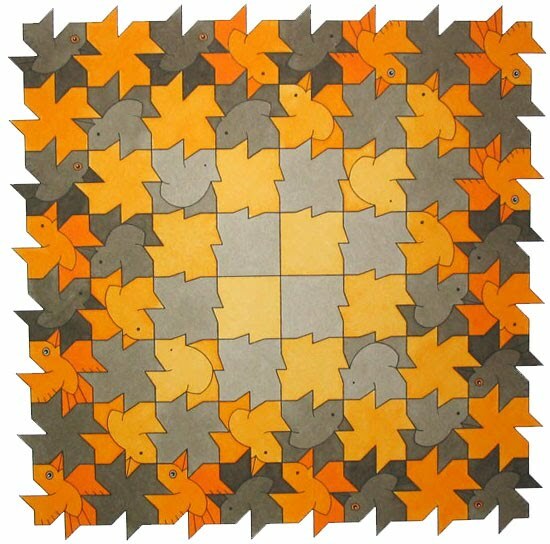 As can be seen, the composition alternates between orange and blue coloured birds, these being based upon the well-known Greek cross tessellation. 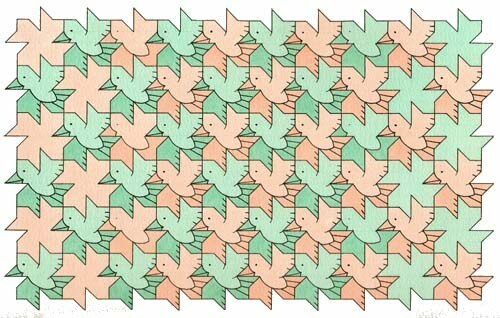 Now, a property of this tessellation is that of a tile that possesses order 4 rotational symmetry, and by extension an interior motif (in this instance a bird) can therefore also be shown in four orientations – see Birds 1, No.1 for an example. Furthermore, as the composition is designed to have no single orientation of motif, a translational example would be inappropriate, hence the choice here, possessing the above order 4 rotation.